Epi-Pet Sun Protector Sunscreen, is the only FDA COMPLIANT sunscreen for both dogs and horses (not for use on cats) in America! At Epi-Pet, we are aware of the aggravating dilemma of family pet members depositing excessive hair, giving off unpleasant odors and scratching uncontrollably. These familiar problems are frustrating to many owners, with no natural multifunctional solution previously available in the marketplace to reverse such unpleasant issues. Until now, pet owners have simply grown accustomed to living with their pet's irritating odor, sores, scratching and high pet service bills. Only temporary relief of the pet's skin and hair problems is noticed, which generally come after continuous visits to the veterinarian and pet groomer. Veterinarians understand medical diseases of the skin and treat them appropriately. Groomers understand the shampooing and haircutting patterns of pets and make a designer look for the pet breeds. Pharmaceutical companies produce products that treat individual skin maladies. No one has coordinated healthy ingredients into the development of one product that cures some skin diseases and treats the esthetics of skin i.e. odor, flakiness, oiliness etc. This High Performance line of skin, ear and coat care products was created by Dr. Michael Fleck, a licensed veterinarian who has practiced animal medicine both in the United States and abroad. Additionally, Dr. Fleck may be the only veterinarian who is also a licensed Esthetician or "human facial skin care specialist." That combination of knowledge set the stage for the creation of this advanced natural skin product for pets. Epi-Pet has the ONLY FDA Regulated Sunscreen For Animals on the Market Today! Don’t let your beloved animals suffer with sunburn! Epi-Pet Sun Protector Sunscreen is the only FDA compliant sunscreen for both dogs and horses (not for use on cats). It is a non-greasy, quick dry formula that is safe if licked after applied to the pet. Epi-Pet Sun Protector Sunscreen is water and sweat repellant. The revolutionary bag on valve bottle is not just great for the environment but is virtually silent when sprayed so the pet is not startled. The Epi-Pet Sun Protector Sunscreen can be sprayed at any angle including upside down! Epi-Pet Sun Protector Sunscreen is ultra-water resistant and ultra-sweat resistant. It is recommended that the product be applied every 2-4 hours if the pet is outside or is in the water for more than 80 minutes. Our sunblock is ideal for all breeds of dogs and horses. Who Needs Sun Protector Sunscreen Spray? Designed for convenience, Epi-Pet offers a wide range of Skin Treatment Kits from small to large! The Epi-Pet Brush/Spray Combos are just as they sound, any sized/scented Enrichment Spray and a Double Sided Brush. The Epi-Pet Complete Kits come in both sizes (4oz. and 16oz.) of any scented Enrichment Spray, a 16oz. Cleansing Agent Shampoo, and a Double Sided Brush. Epi-Pet’s Multifunctional Skin Enrichment Spray is available in 3 different scents and is an excellent way to treat the dry, itchy, flaky, oily and smelly skin issues that so often plague our pets. The Lavender aroma provides a calming, therapeutic effect on hyperactive pets while providing 6 natural insect repelling properties. The Cedar scent also has 6 natural insect repelling properties and has a subtle scent of peppermint and cedar wood. The Unscented skin spray offers relief from skin irritations without the essential oils. It also helps in aiding in hairball reduction in felines when used daily. All three enrichment sprays treat skin allergies and supports veterinary medical treatment for skin allergies. 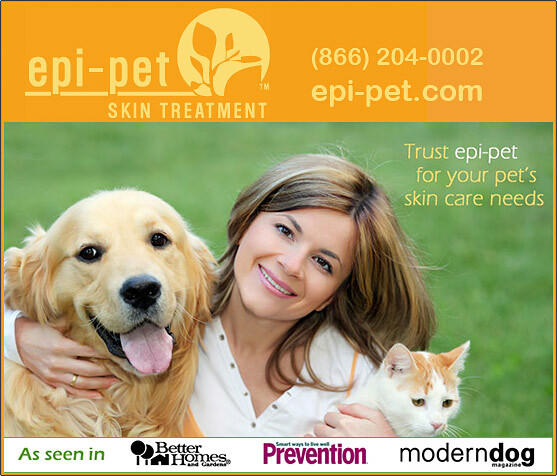 Epi-Pet uses all natural essential oils in their skin enrichment products to provide the highest quality products. This unique formulation includes ingredients such as Galactoarabinan, a highly effective moisturizer found in many popular human skin care products. Anti-Itch/Anti-Oxidant ingredients like Tea Tree Oil and Peppermint help to reduce dandruff on the pet’s skin and hair coat. They also eliminate odor that is often referred to as that “Pet Smell”. With eight skin and hair coat conditioners, your pet will feel like a cloud. That rough coat they once had will be gone because it will no longer be dehydrated. Epi-Pet’s 4oz bottle is a great way to get started with the Epi-Pet Skin Enrichment spray, it has a pump top applicator and offers a fine mist. The 16oz Skin Enrichment Spray has a convenient trigger spray applicator that is great for medium and large breed animals. To reduce itching, shedding and odor use daily with the Epi-Pet double sided brush. All three Skin Enrichment Sprays are available by the gallon. When the skin problems pop up on my dog "Charlie", he starts licking and chewing and then his skin gets sores and the sores get infected. Consequently we have to treat him with antibiotics. The Epi-Pet brush and spray skin treatment keeps the skin healthy and acts as a preventive to other more serious skin conditions that "Charlie" is prone to get. 90% reduction in shedding! What a miracle! I use the whole product line of Epi-Pet treatment on my K-9 units. Their skin and hair coat has never looked better. People are always commenting on how good they look and how nice their coats are when I'm out doing demonstrations. With Epi-Pet it makes it much easier to maintain 9 dogs. My Bull Mastiff has been on a combination of prednisone and antibiotics for a long time for allergies. The prednisone was causing her to have incontinence. I started using Epi-Pet's Cedar Enrichment Spray 3 months ago on her. Since then she has been on Epi-pet I have been able to stop all other medications and I have my Girl back again Thanks to Epi-Pet! Order Your Epi-Pet Products Today! Make sure the animals in your care receive the protection from the sun they need. Call us today and let us show you products to help protect the animals you love from the harmful effects of the sun. Call and talk to us today!